Farmers Electric Cooperative recommends that you have the proper surge suppression device installed for protection of your personal electrical equipment. There are many uncontrollable factors that can cause power outages. These include adverse weather conditions and accidental contact with our powerlines by construction equipment, vehicles or wildlife. When power distribution is affected, there is a potential for an onrush of current – which can occur during the disturbance, during operation of the utility protection equipment, and when power is restored. This onrush, or power surge, is usually caused by a brief voltage fluctuation. It typically ranges from 500 to 1000 volts and hits a component designed to withstand only 120 volts. Even though it might last only a fraction of a second, such a surge can damage delicate parts commonly found in all electronic devices, including your computer, home entertainment system, telephone, appliances and security system. In the case of your computer, a power fluctuation can disrupt software, erase valuable data and damage the hard drive, printer, modem and other related equipment. One level of surge suppression is not enough Two lines of defence are essential to protect your equipment from power disturbances – a heavy duty surge suppressor at your main service panel and several point-of-use surge suppressors downstream. 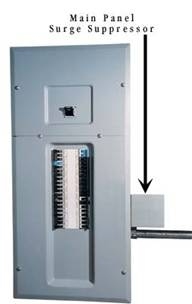 ​The surge suppressor at your main service panel deals with large surges. The smaller point-of-use surge suppressors take care of what remains of surges that get past the main surge suppressor, and protect individual pieces of equipment. They also offer protection from internal surges. Farmers Electric Cooperative recommends investing in a main service surge suppressor and point-of-use-surge suppressors as an easy, economical way to protect your sensitive electrical equipment from power surges. Intercepting the big surgesFirst line of defense: Surge suppression at main service panelMain service panel suppressors protect your home from electrical disturbances originating from the utility supply. They cut big surges down to size, enough so that if any of the surge is left, the point-of-use surge suppressors can intercept it to protect equipment downstream. You must have the main service panel suppressors installed in your home by a licensed electrician. Proof of installation is required for warranty. Local electrical suppliers carry a full range of surge suppressors for every degree of surge protection needed in your home or business. Look for a response time of 5 nanoseconds or less. This is the reaction time of the suppressor. Ask for a suppressor with a visible alarm to signal that the device has suffered damage, since surges can destroy the suppressor’s effectiveness. Good quality building-entry surge suppressors cost between $200 and $700. Point-of-use devices are connected to wall outlets close to equipment being protected. They generally take the form of power bars, receptacle-mounted or plug-in types, and hard-wired receptacles with built-in suppression. Look for certified CSA or cUL and UL 1449 approval. The suppressor should be able to handle a minimum of 120 Joules without burning out, across each of the following: neutral to ground, neutral to line, and line to ground. It is important to ask for suppressor power bars with audible/visible alarms to signal when the device has suffered damage, since surges can destroy the suppressor’s effectiveness. Point-of-use devices are available at computer retail outlets, hardware stores, and department stores. Good quality surge suppressor power bars generally range from $30 to $75. · Certification by CSA or cUL – Ensures the suppressor conforms to safety standards recognized by accredited organizations that certify electrical products to Canadian standards. · UL 1449 – The device meets rigid requirements specified by the Underwriters Laboratories. · Connected Equipment Guarantee – Most manufacturers guarantee that the surge suppressor will protect your equipment up to the dollar amount specified, which could be anywhere from $500 to $25 000. The higher the dollar amount specified, the better. · Clamping Voltage – The maximum voltage that the suppressor will let through to protected equipment. The lower the voltage, the better. · Response Time – The time it takes for the suppressor to respond when it detects a power surge. Look for a response time in nanoseconds (one-billionth of a second) or picoseconds (one-trillionth of a second). The lower the number, the faster the response, the better the protection. Many computers and microprocessor-based devices are plugged into receptacles through a UPS. The UPS uses a temporary battery back-up to maintain a continuous supply of power in case of a utility outage, ensuring that data is not lost and process is not disrupted. A small UPS costs between $250 and $300. Damaging surges may also enter the home or office through telephone lines and cable connections to the TV, VCR, stereo, satellite receiver, and modem. 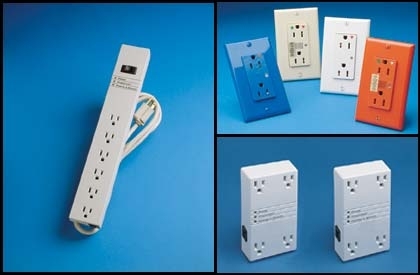 Additional surge protection is recommended on these lines and connections, either through stand-alone devices or in combination with AC plug-in units. Surge protectors are not designed to offer protection from a direct lightning strike, which can pack up to 100 000 volts. But they can protect equipment from surges caused by indirect lightning strikes, which are strikes upstream on electrical lines. There is no definite period for how long a surge protector will last. The life of any protector depends on the magnitude, duration and frequency of surges. If a surge protector has already endured one surge, its effectiveness may be greatly reduced. If you have any concerns, check with the manufacturer. Details of the guarantee for your surge protector may be printed on the box only. Follow the instructions on your guarantee form and keep the purchase receipt in a safe place in case you need to make a claim. As a precaution, unplug your computer when you are not going to be using it for an extended period.